Rosebud is a community of approximately 450 located in central Missouri. While the population is small, Rosebud holds large events at their city park. Surrounding communities gather multiple times throughout the year to enjoy picnics, festivals, and an impressive Fourth of July fireworks display. The park consists of pavilions, swing sets, and a large baseball field with a grandstand. Underneath the stepped seats of the grandstand is a closed off area used for concessions. Drinks and food are sold during local baseball and softball games. It is also used for community dinners and potlucks. Previously, the space underneath the grandstand was not insulated. Volunteers served in hot conditions. Appliances such as freezers and refrigerators had to work extra hard to keep food chilled. 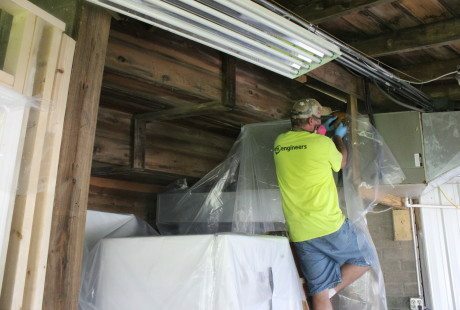 Foam Engineers was contracted to insulate the concessions area. 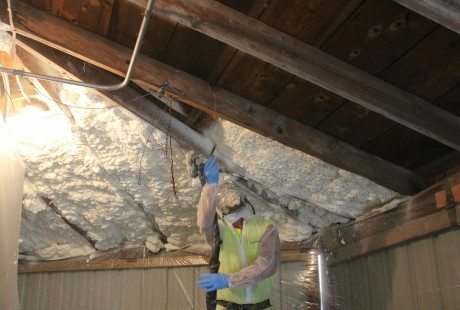 Open cell spray foam was applied to encapsulate the space, making it easier and more efficient to air condition. Foam was applied to many different types of surfaces at varying depths. 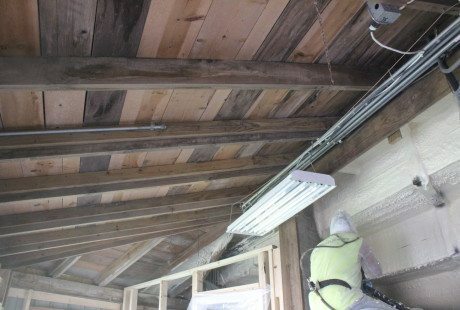 Nearly 5″ of spray foam was applied to the underside of the roof sheathing, and 3″ was applied between the 2×4 exterior wall studs. 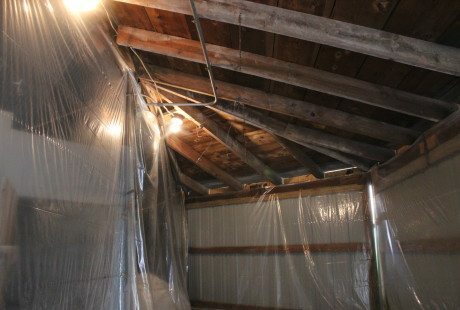 The first step to any spray foam job is to cover the surrounding area. 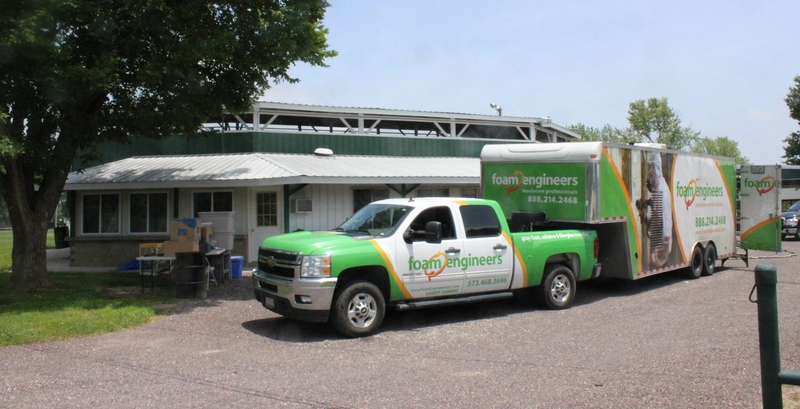 Foam Engineers uses a special covering designed specifically for spray foam application. The surrounding areas have been covered and the underside of the roof sheathing is ready for application of open cell spray foam. 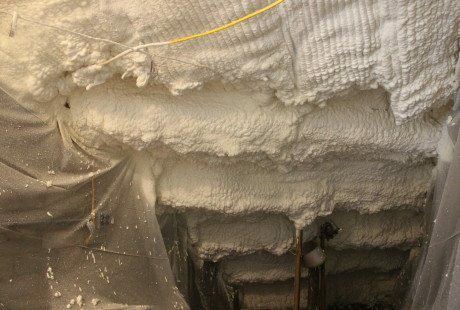 Foam Engineers applies open cell spray foam between the 2x6 rafters on the underside of the roof sheathing. 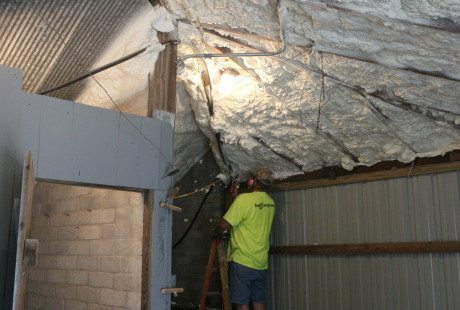 Open cell spray foam is applied to the stepped underside of the grandstands at a community park in Rosebud, Missouri. Spray foam fills the cavities between the 2x4 studs on the exterior walls and seals all gaps and cracks. Two coats of open cell spray foam were applied to the underside of the grandstands. Each coat was a different density, achieving multiple objectives. 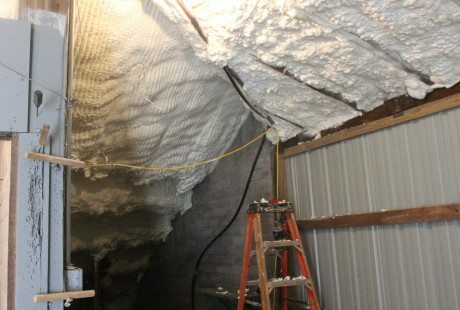 Spray foam can be applied to a large variety of building materials. 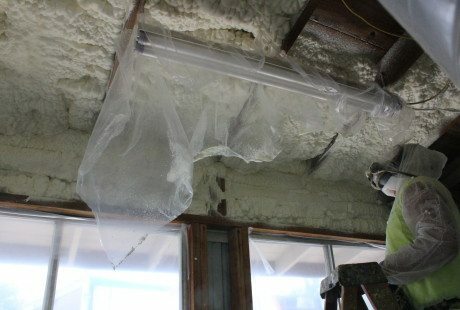 Foam Engineers trims back excess spray foam from the rafters.